Information about Vasant Panchmi, Vasant Panchami 2017 | Brainguru Technologies Pvt Ltd.
Vasant Panchami has a distinct meaning, 'Vasant' means spring and Panchami mean the fifth day of spring. The festival is witnessed in the northern part of the Subcontinent. Although it is mentioned in the ritual calendar of South India, it is not celebrated as a public event but it is celebrated in temples as a religious festival.The same is celebrated in the regions of Madhya Pradesh.Vasant Panchami is a famous festival which is signified as the end of the winter season. Sarasvati is worship on this spiritual festival. Young girls wear bright yellow dresses and celebrate the festivity of this occasion. The color yellow has a special meaning for its celebration as it represents the brilliance of nature and the vibrant colors of life. The whole place is filled with yellow at the time of the festival.It is believed that on this day goddess Saraswati was born. Hindus celebrate Vasant Panchami with great emotions and culture.Saraswati’s favorite color white presumes a special meaning on this day.Statues of the goddess are dressed in white clothes and are worshiped by the followers adorning white garments. Saraswati is offered sweets which are given as ‘prasad’ to all adherents attending the worship.This festival fills the environment with peace and spirituality. Maharashtra: ocassionVasant Panchami is also known for lord Shiva, in Maharashtra, people worship Lord shiva occasion. People worship shiva and Parvati and offer mango flower to god as the ritual. Aurangabad: In eastern parts of the country, citizen worship sun god, Place such as Aurangabad district has its own significance, this day is known for the birth of King Aila and Sun-deo god.People sing and dance on the birth of Sun-deo god. Sufi-Basant: HindusimWho said Vasant Panchami is for Hindus only, it is celebrated by Muslims also as per their tradition. On this day Delhi's Chishti Saint Nizamuddin Aulia's young nephew Taqiuddin Nooh died.The local people offers flowers and are dressed in yellow. Amritsar: On the day of Vasant Panchmi, it starts with the music by singing Basant Raga. This practice is continues until the first day of Vaisakh when Basant Rag came to the end.A fair is held at the famous Sikh shrine of Guru-ka-Lahore. 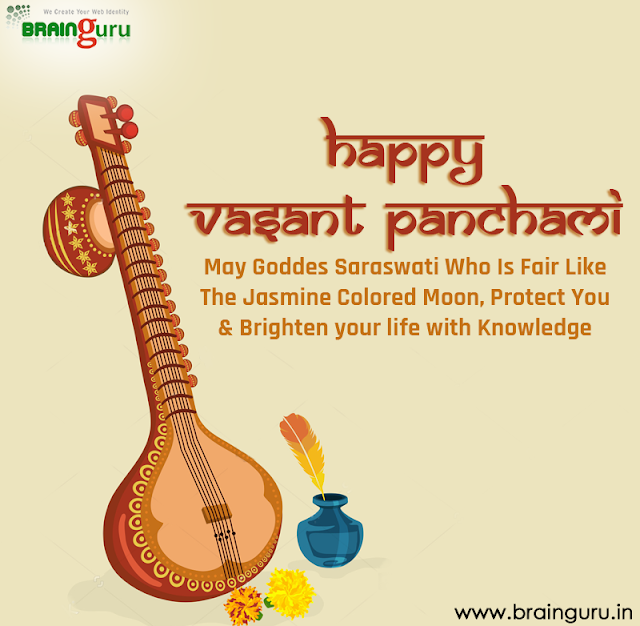 Vasant Panchami is not only the festival of ritual, it is marked as the festival of celebration, Brainguru Technologies is ready to celebrate this festival in a dignified way, the organisation is holding prayers in the office followed by the offering the prasad to the young ones.